Entrepreneurs Liam Manton and Mark Smallwood launched their small-batch spirit in 2017 and now count luxury department stores Harvey Nichols and Selfridges and our venues at New World Trading venues among their stockists. Original (700ml & 200ml) - A clean, crisp and zesty gin is perfect for sipping with tonic and is a versatile spirit for cocktails. Raspberry & Elderflower (700ml & 200ml) - Uses the base of the original gin, along with macerating fresh raspberries over a period of 6 weeks and a subtle elderflower finish. Last year, Matt and Liam also launched a limited edition Christmas Gin, which unsurprisingly sold out in a day! This year the duo plan to develop more exciting flavoured gins, and we can’t wait! Didsbury gin is known for using a combination of fresh peels, which leads to the flavour profile and enhances the overall distillation process by releasing more fragrant essential oils from the ingredients. Fuelled by a passion for Manchester, a shared sense of humour and a love of gin - this is what makes Didsbury Gin unique. On Sunday 13th January 2019, Didsbury Gin founders Liam Manton and Mark Smallwood will appear on BBC Two's Dragons' Den, bidding for investment in the Dragon’s Lair. This is the next step for the budding Manchester-based company who are seeking investment to scale up quickly and become a leading runner in the gin industry. Dragons Den made you thirsty? 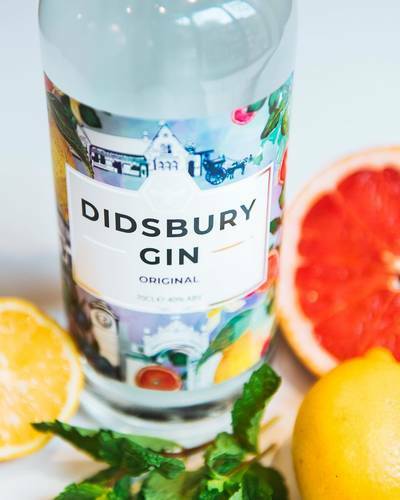 Can’t wait to try Didsbury Gin? You’re in luck! Last year, The Botanist partnered with Didsbury Gin and added it to our drinks menus at all our venues. Ask for Didsbury Gin and our bartenders will serve it as recommended by Didsbury Gin; with lemon thyme and grapefruit zest to enhance the variety of fresh citrus flavours and subtle herbaceous notes of the gin. Throughout January, every registered My New World app member can benefit from our Gin Membership, with access to exclusive pricing on our gins* - including Didsbury Gin. Normally £9.50, a perfect serve of Gin & Tonic will be £6.50 with a Gin Membership - simply by presenting your ‘My New World’ app to your server or bartender. To access exclusive pricing, simply download and register My New World for free to enjoy your Gin Membership throughout January! Not only this, you’ll earn loyalty credit back on everything you spend with us, along with more surprises and rewards throughout the year at venues across New World. *exclusive pricing only applies to a selection of gins, served as a double with London Essence tonic water.